Exclusive: Hillary Clinton has judged that she can wait out public calls for her to release the transcripts of speeches to Goldman Sachs, which earned her $675,000 in 2013, since she expects to soon wrap up the Democratic presidential nomination, as Chelsea Gilmour describes. One of Bernie Sander’s standard attack lines against Hillary Clinton has been to call attention to the hundreds of thousands of dollars in paid-speaking fees and donations that Clinton has received from Wall Street during her career, including $675,000 for three paid speeches to Goldman Sachs (at $225,000 a pop) after she left the State Department in 2013. Sanders has responded by noting that he has given no paid speeches to Wall Street banks and thus has no such transcripts to release. So, Clinton’s campaign continues to scramble, trying to shield her from the impression that she is too cozy with Wall Street while expecting that she will soon lock up the Democratic presidential nomination and make Sanders’s criticism moot. The backlash Clinton has received over the three Goldman Sachs speeches and her ties to Wall Street has, however, forced Clinton to confront an issue which has dogged her campaign from the outset: Namely, that she is an Establishment candidate with close personal and political ties to Wall Street and Big Business, which compromises her objectivity and accountability as a candidate “for the people,” rather than for the corporations. 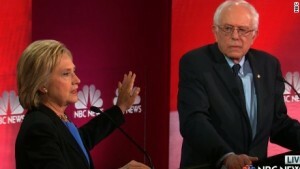 During a debate in New Hampshire, Clinton claimed Sanders’ innuendo amounted to a “very artful smear.” Clinton’s press secretary Brian Fallon called it “character assassination by insinuation,” by implying that Clinton would not be tough on Wall Street because she has financially benefited from them in the past. The real danger in releasing the transcripts is the potential political fodder it would provide Clinton’s opponents, who might seek to use the transcripts as proof that Clinton is in the pocket of, not only Goldman Sachs, but Wall Street as a whole. The Wall Street Journal summarized the speeches as such: “She didn’t often talk about the financial crisis, but when she did, she almost always struck an amicable tone, according to these people. So far, Clinton seems to have judged that the damage from continuing to hide the transcripts is preferable to the backlash she might experience if she released them. According to Politico, “The person who saw Clinton’s Arizona remarks to Goldman said they thought there was no chance the campaign would ever release them. In that case, releasing the transcripts could serve a severe blow to her campaign. Sanders’ campaign would waste no time capitalizing on the opportunity to call-out Clinton as a friend of Wall Street. Regardless, as it becomes clear that this campaign is breaking down to “Establishment” vs. “Anti-Establishment” candidates, Clinton’s ties to her Wall Street and Beltway-Insider past are harming her ability to cultivate broad support amongst a population of voters resentful of Wall Street’s insidious influence over Washington. So what is Clinton saying about all this? Not much. And what she has said has not diminished suspicions that she would be soft on Wall Street, if elected. “No, I don’t, because I don’t feel that I paid any price for it and I’m very clear about what I will do and they’re on notice,” Clinton asserted. But not everyone is buying it. In an often-cited incident, Sen. Elizabeth Warren, D-Massachusetts, described in 2004 how Hillary Clinton flip-flopped on a credit-card company-sponsored bankruptcy bill under pressure as a New York Senator. According to Warren, in the late-1990s, then-President Bill Clinton was pursuing signing into law a bankruptcy bill which had been presented to Congress and written by the credit card companies. President Clinton was eager to sign the bill, in order to further promote his free-trade, neoliberal economic policies. However, after a meeting between Warren and then-First Lady Hillary Clinton, in which Warren explained how the bill would have disproportionately hurt single mothers, Hillary vowed, “Professor Warren, we’ve got to stop that awful bill.” Indeed, Hillary returned to the White House and convinced the President to veto the bill as one of his last acts in office. Another interesting development from this hubbub about Clinton’s ties to Wall Street has to do with whom Clinton would appoint as Treasury Secretary, if elected. Sanders’s reference during the Jan. 17 debate to the two Goldman Sachs executives who became Treasury Secretaries may have spurred Clinton to address the issue. Sanders’s comment referenced the appointment of Robert Rubin, former Goldman Sachs executive, to the position of Treasury Secretary by Bill Clinton after Rubin opened doors to Wall Street donors during Clinton’s first Presidential bid. Rubin was instrumental in crafting “an economic policy — known as Rubinomics — that was applauded by Wall Street but viewed critically by many on the left. When then-first lady Hillary Clinton decided to run for the Senate in New York in 2000, she turned to Rubin and Altman to introduce her to key players on Wall Street,” reported the Washington Post. If Clinton were to make a clear promise not to appoint someone from Wall Street as Treasury Secretary, she could quell some voters’ fears. But to be sure, this was not such a promise. The Treasury Secretary issue may also have been identified by the Clinton campaign as an opportunity to strike back at Sanders for what Clinton perceives as his political naivety. But there is another issue regarding paid speeches that has yet to be fully addressed by the media, which may prove to be a further thorn in Hillary’s side. That is the question of Bill Clinton and the “two-for-one” aspect of the Clinton’s political machine. An article by the Wall Street Journal relates how Hillary Clinton, while Secretary of State in 2009, helped Swiss bank USB with its IRS woes. “Total donations by UBS to the Clinton Foundation grew from less than $60,000 through 2008 to a cumulative total of about $600,000 by the end of 2014, according to the foundation and the bank. While this still does not prove a direct link between favors by Hillary and payments received, it further blurs the line of where the Clintons’ political activities stop and their personal ventures start. Earlier in the campaign, I wrote an article analyzing the sum of Hillary’s paid speeches during the 14-month interim between Clinton leaving the State Department and before announcing her candidacy for President. That interim spanned January 2014 through March 2015, and resulted in Hillary making 53 paid speeches to the tune of $11.8 million dollars in fees, all while it was widely believed that Clinton would run again for President in 2016. That analysis, however, did not include the $675,000 from Goldman Sachs, as those speeches were delivered in 2013, meaning they occurred before the time period for which she was obligated to publicly disclose her income. Further investigation of Hillary Clinton’s financial disclosure form shows at least 16 speeches made by Bill Clinton to banks or other financial service industry companies during that 14-month period. Besides three speeches to USB Wealth Management totaling $675,000 (the same amount Hillary received for her Goldman speeches, by the way), Bill also gave paid speeches to: Bank of America ($500,000), SCIP Capital Management ($250,000), Deutsche Bank AG ($270,000 + $280,000 to Hillary for her October 7, 2014 speech), Veritas Capital Fund Management ($250,000), Apollo Management Holdings ($250,000), Texas-China Business Council ($265,000), Affiliated Managers Group ($225,000), Experian ($225,000), Insurance Accounting and Systems Association ($225,000), Centerview Partners ($225,000), Jefferies ($225,000), Citadel ($250,000), and Thomas Lloyd Global Assets Management (Schweiz) ($200,000 via satellite). That means that Bill Clinton was paid $4,035,000 by the financial sector for 16 appearances over the course of 14 months. Keep in mind, those 14 months represent the interregnum between when Hillary Clinton left State Department and before she officially announced her candidacy (but it was widely speculated she would run). Regardless of whether Hillary believes (or will admit) that her fees from the financial industry have influenced her polices or not, the fact that campaign finance law requires her to disclose her spouse’s income should be a guiding indication of what the rest of us already know: that payments made to one’s spouse or close family members can equally represent a conflict of interest, just as if the candidate had been paid directly. Chelsea Gilmour is assistant editor of Consortiumnews.com. Basically, if Intel is ready to pay for two years of community college for 73 Vietnamese workers for training, they could do that for Americans. The “Gold Standard” should be ‘do it here and do it there’. Perhaps this why she changed her mind, but if investments include training Americans equally as foreigners, this fair trade agreement would be good for America. Why would she release her speeches before she is the nominee? Hillary Clinton, Secretary of State, Goldman Sachs on TPP. i liked Bernie’s comment: if these speeches were worth over one hundred thousand, they must be good and I would like to hear them. Is she the sort of inhuman monster that the American people really want as President? If so, no god will save the World let alone America. If she said nothing wrong, she’d have nothing to hide. I’m coming to hate this upcoming election. Sanders is the only candidate to whom I’d normally give even a passing grade, and from everything I can tell the ‘fix’ is on to guarantee he loses the primary to Hillary. Hillary is so utterly awful that under any normal kind of circumstances she’d be as much a laughing-stock as Ben Carson. But not this time. The Big Bankers and the Neocons really want the woman in the White House, and what worries me is the prospect they’re using the same winning strategies which worked so well for them in 2008 and 2012 – to run somebody against her who will cause the majority of the voters to want to upchuck at the mere thought of that other ‘somebody’ in the Oval Office. Trump has been leading a charmed life so far, despite the extensive slime trail he has left behind him through the years. Is he the chosen “even worse than Hillary” selection this year? Are the big moneybags holding off on hitting him until he is safely the opposition? This is a hint of what they’ve got on Trump from years past. Is it enough to push voters into plausibly switching to the dreadful HRC? Already notables like Robert Kagan have endorsed the warmongering Hillary. Could Kagan and folks like him shift Republican Fundamentalists from the “R” to the “D” place on a ballot? Would enough Democrats buy into the “lesser evil” as they did in the last two elections, or would they stay home after learning their previous lessons? IMO confusion and uncertainty is an essential part in manipulating elections with the no-verification computer voting devices. If there are enough ‘factors’ which could explain the resulting vote total on November 9, less attention will be directed into election tampering. Odd thought – what if it’s necessary to use the Supreme Court again as happened in 2000. Is somebody looking ahead to prevent BHO from putting an unpredictable wild card on the court before the election. I tell you, this election is already driving me into bat**** crazy territory. One can no longer separate out Clinton financial pandering from Hillary’s failed neocon foreign policy at State. Together this couple has been a disaster for America. Their decisions in banking and foreign policy are proven failures. It will take a generation of brilliant leadership to mend the problems they have created for the American people. Combined, they truly are “The King and Queen of Chaos.” No more Clintons and no more Bushes even if that has to be written into the law. After Libya there is nothing more to say about Hillary Clinton and she scares me more than any other presidential candidate. Her gloating about the terrible painful death of Libyan leader Muammar Gaddafi, who brought independence and prosperity to his country, revealed a deeply psychopathic personality, revealed a monstrous evil mind which for sane people is hard to comprehend. But, just for good measure, missing from the discussion about Hillary Clinton’s record has been her work in Haiti, where she blatantly manipulated and threatened Haitian government officials to control electoral outcomes. She and her husband were successfully promoting a sweatshop-led development model, while the money which the Clintons collected was wasted for vanity projects and nothing of it did reach the needy. Of course I would prefer Sanders, though if I compare the hopes he raises with the hopes Obama raised I cannot rule out a big disappointment in the end. Bernie Sanders is the working-class Brooklyn boy who migrated to Vermont in 1968, was embedded in the counterculture scene, and joined the Young People’s Socialist League. As it seems, he considered himself a socialist since then, though he may be no more than a right-wing social democrat by European standards. This is nevertheless remarkably brave in a nation where “Socialism” is a swearword, used successfully to smear political opponents, and where compassion, humaneness, social responsibility are considered as signs of weakness. Having said that, it appears that Sanders has no interest and no knowledge in foreign affairs and that he would do nothing to end or at least reduce US worldwide meddling. His foreign policy advisors include AIPAC people and his record doesn’t instill hope and exposes him as the typical cruise-missile progressive. Sanders supported the wars in Iraq and Afghanistan, including President Obama’s decision to maintain a troop presence indefinitely. He supports Israel, including the bombing campaigns in Gaza. He supports drone assassinations, with faintly expressed regrets that they claim innocent lives. He supports wasteful military spending, especially when it sends jobs to Vermont, culminating in efforts to get F-35 fighter jets based at Burlington Air Base. No “hope and change” this time, we had that already. Maybe some small change from Wall Street and the MIC. One shouldn’t overestimate the influence of US Presidents over the “shadow government” (also known as “deep state” or “permanent government”). Can we rest assured that US presidential elections are just an absurd theater without any real consequences? Sanders is not likely to win the nomination and Hillary Clinton scares me even more than Donald Trump. No good choices and anyway, living in Europe, it is not for me to choose. Don’t people in representative democracies not in the end get the political leaders they deserve? Even if the game is rigged, no one is obliged (for now at least) to sit in front of a TV or computer screen and undergo the daily mass media brainwashing. Aren’t US citizens still allowed to critically evaluate the news reports and look for alternative news sources? Iranian and Syrian channels are banned in Europe, probably also in the USA, but can be found on the internet. The “great firewall” of the Western hemisphere can be as easily bypassed as the great firewall of China’s internet. One is not forced to use Google, Bing, Yahoo and to fall victim to their ranking algorithms. Are artlessness, low education, and lack of curiosity ones personal fault or are they the result of individual talents, upbringing, and the prevailing social climate? In the latter case nobody could be blamed for it, the responsibility rests on society and culture. In the latter case the question arises, how to chance the prevailing social climate to raise critical thinking and well informed citizens and not clueless simpletons who just fall for the demagogue who coins the most popular and easily to remember campaign slogans. Sure, but the average American is not only overworked to the point that they have limited time, energy and ‘head space’ for seeking out things like alternative media, they also are largely unaware just how corrupt and controlled mainstream sources actually are. I mean, they do get the sense that they’re being bullshitted, and that spin is everywhere, but the idea that just about everything they see and hear could be part of a concerted effort to shape an often fictitious public worldview is a bridge too far for most Americans, and they’re likely to regard anyone suggesting so as a nutty “conspiracy theorist” (a term they have been taught to use as pejoratively and venomously as possible). Whoever said that it is easier to get the public to believe the Big Lie rather than small fibs was on to something, as there are tens of millions of Americans who simply refuse to believe the worst about their government, media, and other institutions that fail them no matter how much evidence accumulates. Put all that together, and the number of Americans that seek out alternative media and can use it to help discern fact from fiction amount to a rounding error. Thank you for this reply which I have saved and will hopefully be allowed to use (when it is appropriate) in my own blog. Education in Europe is also deteriorating and totally geared towards creating well functioning employees mainly in technology and science. This gives European companies a competitive advantage in the global war for markets and at the same time diminishes the threat which critical and well informed citizens could pose to the system. Edward Bernays had countless disciples and one cannot overestimate the damage he has done (promoting smoking, fluoridation, calling for the manipulation of public opinion). I’m not proud that he hails from my home town. Undoubtedly US-Americans are the masters of deception, subtle (more or less) exploiting primal urges and fears. Watching John Wayne riding into the sunset with a pretty lady in his arms, one gets an idea how it works. The products of Hollywoods dream machine and all other US dream machines are both hilarious and brutally effective. The simple minds are calmed, sedated, appeased, sometimes even uplifted, the intelligent and educated citizens are repulsed, demoralized, sickened. The informed and critical citizens know that they cannot win at the ballot box. But they can think a few moves ahead, accept that things will get worse before there is any chance that they will get better, and prepare for hard times and dark days. Many people are working on methods, strategies, remedies, solutions, changing their own lives respectively to give an example. This movement will get stronger, while the old party organizations will become irrelevant and wither away. Occupy Wall Street failed, but when the pain increases, another try with a more practical oriented approach could have an impact. Perhaps the site recovery is still a work in progress, but this was the first thread where comments were visible to me. Earlier I’d thought it odd nobody was saying anything, but when my own brief post appeared I forgot about it. But after clearing my cookies, that post disappeared. With my second post everything came back. A second deliberate cookie removal and once again I could see no comments except for the ones above me on this current thread. This is going to be a problem for people who like to read the comments along with the longer essays. Also, Firefox gives me a scary warning about consortiumnews.com being a dangerous place, and it’s necessary to jump through hoops to get past that warning. Regarding the current topic, it’s my own opinion that the arrogant and corrupt Clinton could beat Ted Cruz, but would lose to Donald Trump. All the chatter about the Republican Party splintering is just that – idle chatter. The “R” family members I know will vote for Trump – period. The sample size of “D” people I know is too small to remark about what some of them will do, but there are no circumstances whatever I’ll vote for Hillary. She and Trump match up well on the incompetence and corruption factors, but Trump shows signs of not being a raving maniac wanting to start a war with Russia, China, and anybody else the neocons have on their ‘hit’ list. Frankly, I can’t actually cast a vote for Donald Trump unless he takes a much stronger stance against torture than he has, but I can and will stay at home election day with regard to the presidential contest if it comes down to those two. It’s a cesspool of corruption with the Clintons swirling around in the middle of it. What a stink! Here’s a thought; what if the Benghazi terrorist had hacked Hillary’s personal unsecured server? Would this not be the end of her political career? Her Wall Street speeches would become mute, compared to what I have suggested here. She might as well release them. would that revelation actually change the mind of a single voter ? I’m sickened by Hillary Clinton. I have stomach pains thinking there are dumb people out there that vote for this woman. She is all talk when it comes to the American people. She will say anything to get elected. Her and Donald are both sickening. I can’t believe it’s come to this. As a service member for the last 13 years, I can’t imagine what Hillary or Donald have lined up for the last half of my career. Why are these people ruining my country? Do they really think greed has no consequence? I’m placing my bet on Bernie because I think he actually does care about the American people. Speaking of Bernie, how does a man march for desegregation in the 60’s and NOT get the black vote? Are you kidding me? What has Hillary done for the African American Community? When will the American people wake up? Pull your head out of your Iphone!!! Wake up people!!!!!!!!!!!!!!!!!!!! Please check out the book”Queen of Chaos” by Diana Johnstone, available on Amazon and Kindle. Very informative about Hillary’s stance towards a hawkish foreign policy. It is pointed, factual, and hits the nail on its head. Hillary probaby gave the same speech/pep talk over and over to different audiences within and without GS. She would be embarrassed if it became known that she was paid so much for so little substance. I am amazed how Hillary Clinton is bluffing her way through this election campaign as if she is already US president. When you look at her eyes you know you have an insane woman who is hungry for power. She is dangerous and no wonder Bill was having affairs. He looks like he is sick anyhow.. Hillary Clinton who is representing the large banks, defence industry and of course the Washington establishment who are afraid to lose their power over the White House when ‘the new kid on the block Donald Trump gets elected. The anti-Trump smear campaigns in MSM have already started with lies and insults to American voters by telling them they’re stupid if they vote for Trump. Let’s make it clear with Donald Trump in the White House the hard working American Middle Class and Blue collar workers will have again a representative in Washington. Like former president John F. Kennedy said ‘ the American people have only ONE representative in Washington and that’s the President of USA. Another reason he and his brother Robert were murdered. And as of today several conspiracies accuse the FBI having pulled the trigger. So even if Donald Trump wins the Republican nomination a lot of things could happen to him on the way to the White House! I don’t know about your Trump convictions, but I do know that Lady Hillary MacBill was once heard muttering “Out, out, damn spot” regarding a blue dress. Nice twist, Lady Macbeth and “I did not have sexual relations with that woman” – nice! A Clinton “bought off”. I’m shocked, shocked, shocked. That is only money. “Money makes the world go around”. Dontcha know? For me, the continual disasters of “regime change” is more important due to the immensity of human suffering that keeps the war machine well fed so it can continue to buy politicians who vote for war. Sixty million refugees, a new world record. “We came, we saw, he died” (followed by chuckling) is particularly distasteful considering the COMPLETE disaster it caused and the gloating over the fact that Ghadaffi was sodomized to death with a bayonet. That comment was right from down there with another woman Secretary of State who said the death of 500,000 children in Iraq was worth it. Oh yeah, a special place in Hell. Pablo Diablo… You hit on almost every point that I think about Hillary Clinton. I have shown her “We came, we saw, he died – ha, ha, ha” to a few people because I personally think she is a sociopath. I find it amazing as well that people are still backing Hillary with endorsements such as Madelaine Albright who believed that the death of a 1/2 Million children was worth it to have sanctions on Iraq. Then add in people like Robert Kagan and it really paints the picture of what kind of President Hillary Clinton would make – though to be fair, I don’t think that many candidates on either side of the aisle will be much better. I am not an American but I do know that whomever the US elects is going to effect the entire world and we are already in a state of never-ending warfare due to the US’ horrendous foreign policies. I just hope that if Bernie Sanders does not get the nomination on the Democratic side that people will not vote for Hillary but maybe someone like Jill Stein who I heard an interview with and her answers were very intelligent.